So for some weird reason (maybe it's my new-found money management habits or the fear this truly is my last pregnancy), I've been ridiculously gunshy about buying maternity clothes this pregnancy. The only maternity clothes I started out with this time was a swimsuit - not helpful. At first, I could get by wearing clothes I'd shrunk out of last year working with Shaklee. Realistically, I should have known that could only last so long. I was lucky at Christmas, and my sister-in-law gifted me a maxi dress, one long sleeved tshirt, and one short sleeved tshirt. Those pieces quickly became the center of my wardrobe when my belly hit a growth spurt in January. I finally "splurged" and bought 4 long sleeved tops on clearance from Old Navy, a set of 2 pairs of leggings and a pair of pajama bottoms on sale at Motherhood. Then, I bit the bullet and bought a pair of maternity jeans (on sale) from The Gap. I took a pair of Sweetheart skinny jeans I'd bought from Old Navy well over a year ago (back when I weighed this much, but without the baby). They already have a little stretch, plus there's the added room in the thighs I've started needing since the baby weight started to pack on (hey - it's the third trimester - you can cut me some slack, because I'm feeling miserable about it). All these jeans were lacking was some additional circumference in the waist. We've gone WAY past the hair-tie-to-hold-the-pants-up stage here. I picked up some 3" wide black elastic from Joann's, then set to work. Because of the rise of the jeans (ie not low-rise), I had to stitch two pieces of elastic together to get it wide enough. It was super simple with a zig-zag stitch on my sewing machine. I cut the waist band on either side, then ripped the seam in. I stitched the elastic in before cutting away the excess elastic, then I reinforced the edges with a zig-zag stitch to avoid fraying. Finally, I added a top stitch on the front for a cleaner look and added durability to the seam. It actually turned out pretty well, only cost me about $5, and now I have a second pair of jeans I can wear that doesn't make me feel nauseous from being too tight on my belly. Win-Win, right? What DIY projects have you completed lately? Any fun sewing projects? 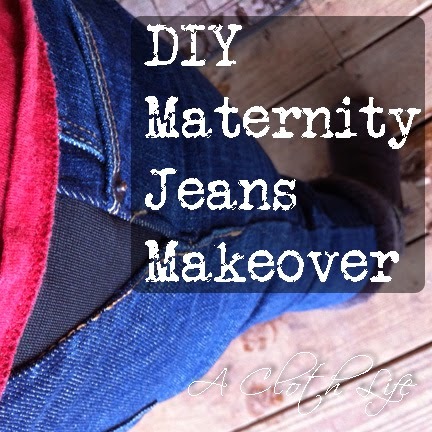 Ever hacked your own clothes for maternity wear? Trust me, this is not the last piece I'll be sharing with you here!